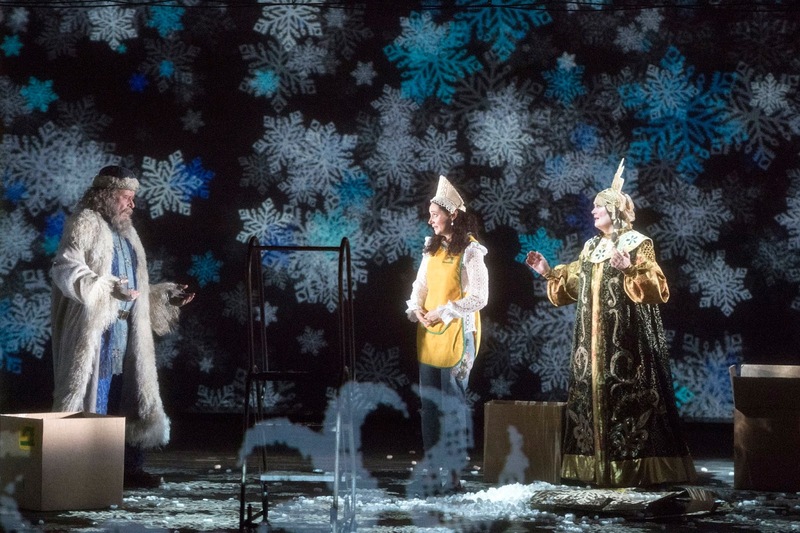 Friday 3 February 2017's performance of Rimsky-Korsakov's The Snow Maiden (Snegurochka) by Opera North at the Grand Theatre, Leeds began with an announcement. Both Aoife Miskelly, who was to sing the title role, and Bonaventure Bottone, who was to sing the role of Tsar Berendey, were ill. 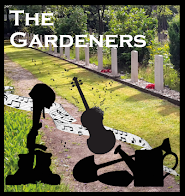 Instead the roles were sung by their covers, Daisy Brown and Ivan Sharpe (a member of the Opera North Chorus), both of whom had sung the roles earlier in the run. 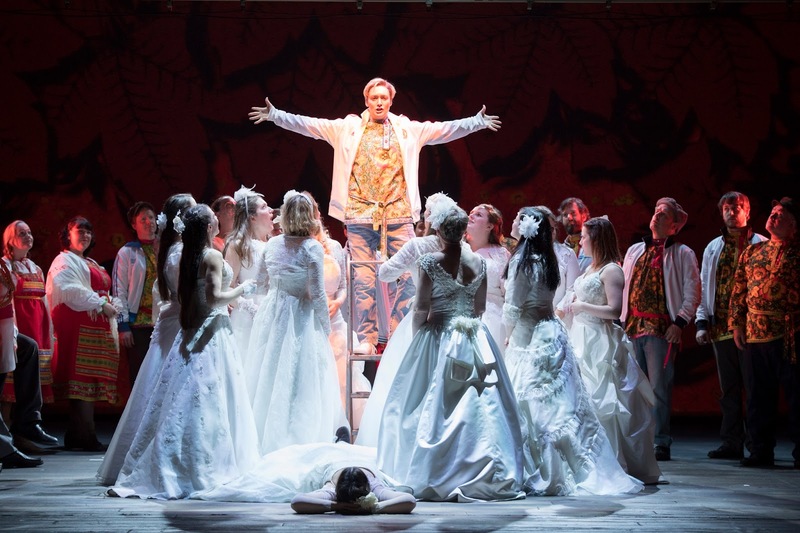 The production was directed by John Fulljames with sets by Giles Cadle, part of Opera North's Spring tour of fairy-tale operas (see my my review of Hansel and Gretel) all sharing the same adaptable set. Costumes were by Christina Cunningham, lighting by Matthew Haskins, video by Will Duke and choreography by Lucy Hind. Yvonne Howard was Spring Beauty, James Creswell was Father Frost, Daisy Brown was the Snow Maiden, Joseph Shovelton was Bobyl Bakula, Claire Pascoe was Bobylikha, Heather Lowe was Lel, Elin Pritchard was Kupava, Phillip Rhodes was Mizgir, James Sharpe was Tsar Berendey and Dean Robinson was Bermyata. Leo McFall conducted the orchestra of Opera North. The opera was sung in a new English version by Alasdair Middleton. The Snow Maiden was Rimsky-Korsakov's third opera, premiered in 1882, and represents his first really mature work for the stage. All of the ideas which the composer was to use later in his operatic career are present, particularly a fascination with the ritual of the Old Russia and its associated songs (The Snow Maiden uses a lot of calendar songs designed to go at a particular point in the year), and the combination of Old Russian, Oriental and Western music. But also a discursiveness and a lack of dramatic impetus. 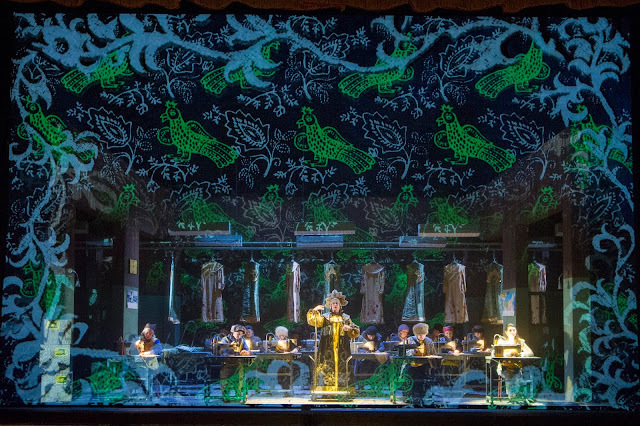 Rimsky-Korsakov's operas are largely leisurely affairs, taking their time. The use of rituals for welcoming Spring, a wedding and other such moments in The Snow Maiden mean that the piece is slow to catch fire. In fact, in terms of structure (though not in terms of musical style or dramatic content) the work reminded me very much of Rossini's Guillaume Tell, with the same long-breathed act structure and the use of choral/dance divertissements to help depict a community. And the sense that the drama builds slowly out of this. As such it is a structure which you meddle with at your peril, though Opera North did indeed cut the work. David Nice in his review on The Arts Desk lamented the cuts, but at three hours including a single interval the piece was certainly long enough for a company that is taking the work on tour. John Fulljames first directed the opera at Wexford in 2008 and it would be interesting to know how his ideas have changed. He was clearly concerned to reflect the sense of time passing and ritual, whilst steering clear of a fully traditional production. There was also a vein of gentle humour in the production, not making fun of it but including quirky details to help enliven the texture. 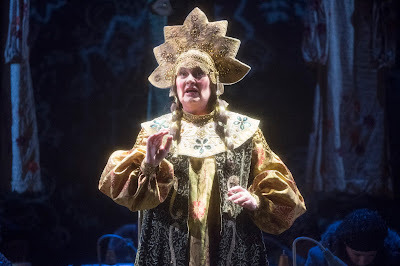 I think without a detailed knowledge and love of Russian folk-lore, the opera might indeed come over as a bit 'pudding-y' without something extra. So when we entered the theatre a projection of the January page of a calendar was up on the scrim, with a picture of Tsar Berendey. Throughout the opera, to indicate the passing of time and seasons, these calendar pages would gradually turn, with the photographs of the Tsar in increasingly unlikely places (June had him in a bathing costume at the seaside). The village of the original was now a sweatshop where the women worked on clothes and costumes, what they were working on varied according to the season and emotional texture of the opera. In the opening scene Father Frost costumes make way for Spring Beauty ones, at another point it is jeans, and in the second half, wedding outfits, and finally with the coming of Summer we have growth and baby clothes. Similarly the characters of Spring Beauty and Father Frost arose out of mannequins displaying their clothes with a neat piece of stagecraft making the Spring Beauty mannequin turn into mezzo-soprano Yvonne Howard. Frankly, I am not entirely certain the sweatshop idea was ideal, for a start it cramped the stage, but Fulljames was restricted by having to work within the same basic structure as the other two operas in the season, and the budget (and requirements for touring) at Opera North was never going to run to the sort of large scale production we might see at the Bolshoi (and which Covent Garden gave to Rimsky-Korsakov's Christmas Eve). But Will Duke's atmospheric video went a long way to softening the edges and creating magic. Much of the performance used a scrim (not something I really like) and Duke used this to imaginatively enliven the visual image with graphics, and on some scenes these spilled over the whole stage. Also, choreographer Lucy Hind got a remarkable amount of colour and movement into rows of women sitting at sewing machines! The role of the Snow Maiden is frankly one of those tricky roles where the singer needs to spent part of the piece as an innocent youth and then open up with big dramatics at the end (think Madame Butterfly or Tatyana in Eugene Onegin). Daisy Brown had an ideal voice for the opening acts of the opera, a slimline lyric coloratura, and a stage presence which emphasised the character's naivety and innocence, her lack of understanding of the emotions of the real world. She made an appealing Snow Maiden, and sang the role with careful beauty, great charm and a sense of poignant naivety, In the final act, where in her desperation to learn to love the Snow Maiden calls on her mother and, on learning to love, dies, Daisy Brown gave the role her all but wisely without straining her voice. She concentrated on ease and fluency, but ideally the role needed a little more. That will come, as Brown's voice developed and what she lacked in amplitude she gave in commitment. I don't usually report on a cover performance in such detail, but felt that Brown's considerable achievement needed coverage. Yvonne Howard made a warm and appealing Spring Beauty (the Snow Maiden's mother), singing with flexible tone and a nice charm. The role is hardly a character, more of an idea or a concept, and allowed Howard to bring personality to bear. 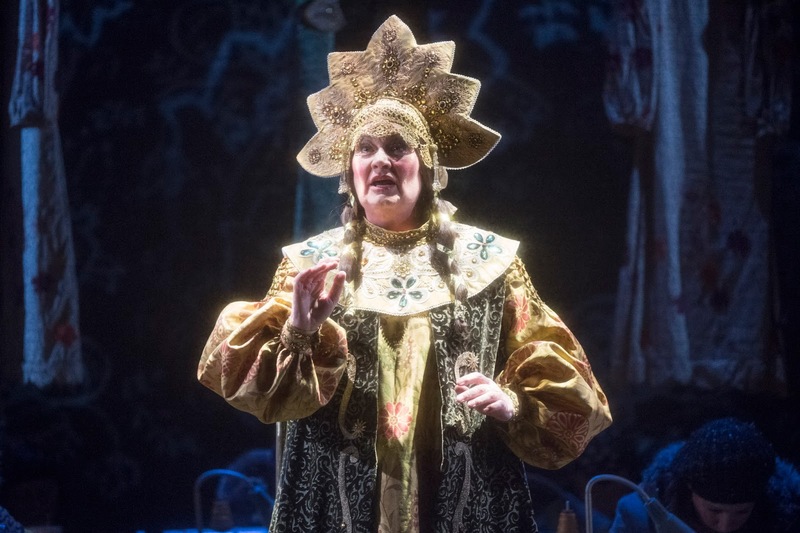 Father Frost (the Snow Maiden's father) was sung by James Creswell with incisive character and colour, making the most of what is a relatively small role. Father Frost has locked up the Snow Maiden to prevent her melting in the sun, and Creswell made this seem more out of concern than tyranny. Heather Lowe was a near ideal Lel, the shepherd boy whose on/off romancing of the Snow Maiden triggers the final crisis. 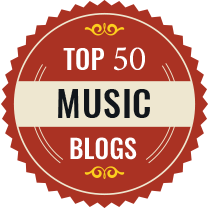 Lel has a series of songs which form set pieces of the opera, with Heather Lowe singing with attractively flexible tone and great charm and personality. This latter was key, she looked and felt like a lively teenager with a convincing rangy physique du role, and a lively sense of how a young man behaves. 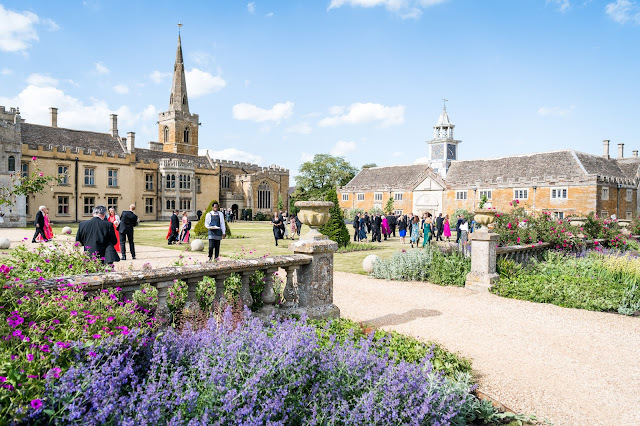 The opera is Midsummer Nights Dream like in its mix of mismatched loves (Ostrovsky, on whose play Rimsky-Korsakov based the opera, included a heavy admixture of Shakespeare into it). Kupava (Elin Pritchard) started out betrothed to Mizgir (Phillip Rhodes), was dumped and then chosen by Lel. So Pritchard went through the gamut of emotions, making Kupava's despair funny yet touching, shot through with anger, and flowering in the final act. Mizgir is a strange role. He disappears from the action for a lot of the important periods. John Fulljames' ingenious solution was to have Kupava tape up his ankles, wrists and mouth (in fact he is delivered to Tsar Berendey's court in a box!). 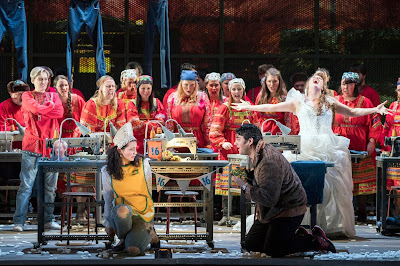 Only at the end of the opera did Daisy Brown's Snow Maiden release him, allowing him voice for the powerful ending. Rhodes made him vibrant and interesting, despite the rather monomaniacal side to the character. 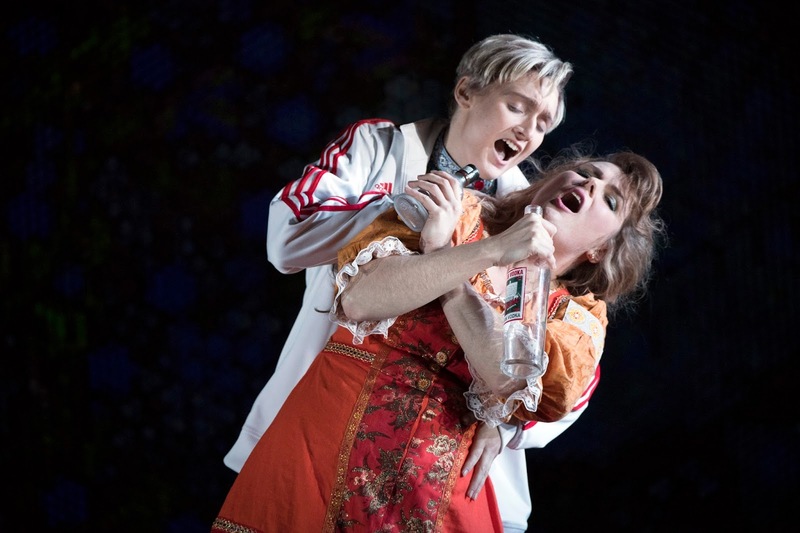 Claire Pascoe and Joseph Shovelton as the Snow Maiden's adoptive parents, were delightfully characterful, he complete with a bottle of vodka and she constantly trying to part him from it. James Sharpe was a find stand-in as Tsar Berendey, bringing a nice sense of character to the dialogue, though Sharpe was somewhat tested by the arias. Dean Robinson performed the role of Bermyata, Tsar Berendey's major-domo, with aplomb, coping well with the comic business which John Fulljames had created for the role. Diction was good and we hardly needed the surtitles, though it was a shame that the production and translation could not have decided on the same name for the title role! Whilst the publicity and programme called her the Snow Maiden, Middleton's translation referred to her as Snow Princess. Leo McFall and the orchestra of Opera North brought a feeling of lively character to Rimsky-Korsakov's attractively melodic score. Inevitably perhaps lacking the epic sweep of larger scale performances, McFall and the orchestra made the music immediate and melodically appealing, with some nice toe-tapping moments. 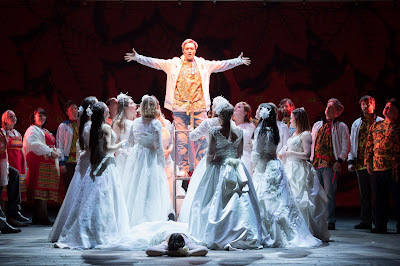 UK opera thatre still has not really discovered the operas of Rimsky-Korsakov, and John Fulljames' staging for Opera North was a striking example of bringin immediacy and charm to Rimsky-Korsakov's ritualised epic theatre.